On Friday Roger Stone was arrested in the wee hours of the morning. Stone was awakened in his Florida home by a slew of FBI SWAT team. CNN just happened to be there to film the arrest. The SWAT team, with helmets on and with guns drawn, banged on Stone’s door and demanded that he come outside. They barraged into Stone’s home in Fort Lauderdale. Stone was asleep but woke up and went to the door in his pajamas. 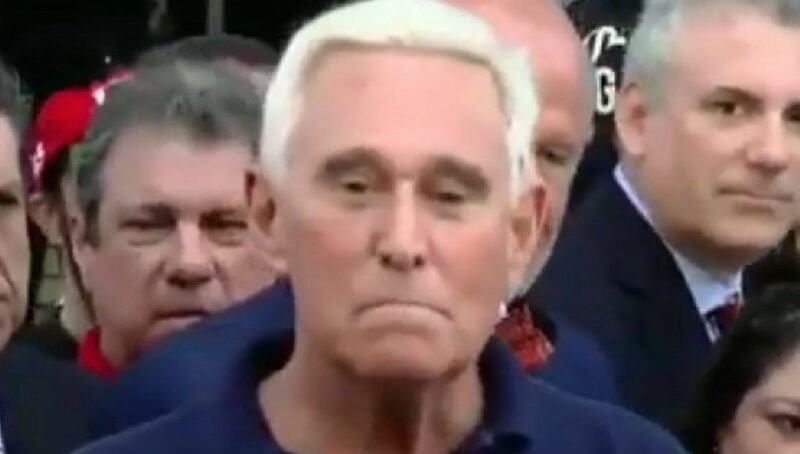 Stone, aged 66, was taken into custody after being indicted by a federal grand jury yesterday as part of Robert Mueller’s investigation into Russian meddling and potential collusion with Trump campaign associates during the 2016 presidential election. During a press conference Stone said that his wife and dogs were frightened by the flashing lights and manner in which he was taken into custody. For months, Stone has warned that he could be indicted. He has repeatedly denied the accusation that he actually had advance knowledge of WikiLeaks releasing hacked emails of Democrats during the 2016 campaign. Stone adamantly proclaimed that he will not dish dirt on the president to prosecutors. The sealed indictment was unsealed on Friday. It does not charge Stone with conspiring with WikiLeaks or with the Russian officers Mueller says hacked them. WikiLeaks is the anti-secrecy website that published emails about the Clinton campaign in 2016. or with the Russian officers Mueller says hacked them. with guns banging on Stone’s door and demanding that he come outside. The indictment accuses Stone of lying about his interactions related to the WikiLeaks’ release during probes by Congress and Mueller’s team. The indictment does raise questions about the hacked emails. Stone is a former Trump adviser. He advised Trump for years but left the Trump campaign in August 2015. He served as an adviser to Trump for years before he ran for president. He left Trump’s campaign but kept regular contact with and publicly supported the Trump campaign through the 2016 election. The indictment states that during the summer of 2016, Stone spoke to senior Trump campaign officials about WikiLeaks and information it might have had that would be damaging to Democrat Hillary Clinton’s campaign. The indictment says that Stone was contacted by senior Trump campaign officials to inquire about future releases. It also says Stone continued to communicate with members of the Trump campaign about WikiLeaks. The indictment, which is 24 pages, alleges that Stone worked to obstruct the House Intelligence Committee’s investigation into Russian interference in the 2016 election. Mueller’s team alleges Stone made false statements to the committee and denied he had records that were sought by the committee and persuaded a witness to provide false testimony. Mueller’s investigation has gone on for more than a year and half but no collusion has be uncovered. Previous articleThe President is Not Safe, Political Operative for Trump Roger Stone Arrested, FBI Corrupted, Has Fascism Come to America? There is no collusion on the president.. it’s all #44 administration and the Clintons.. Mueller gets paid un der the table from the Clintons..Mr. Mueller you can’t make people lie to fit the globalist and nwo agenda..your a disgrace to this country ..your a Nazi..you hate everything about America..stop with this witch Hunt.. everything goes against the last administration not this one.. stop wasting taxpayers money. God sees and knows everything you do..we the people aren’t stupid.. enough is enough..